Interloop hovers above the escalator banks at Sydney’s Wynyard Station. 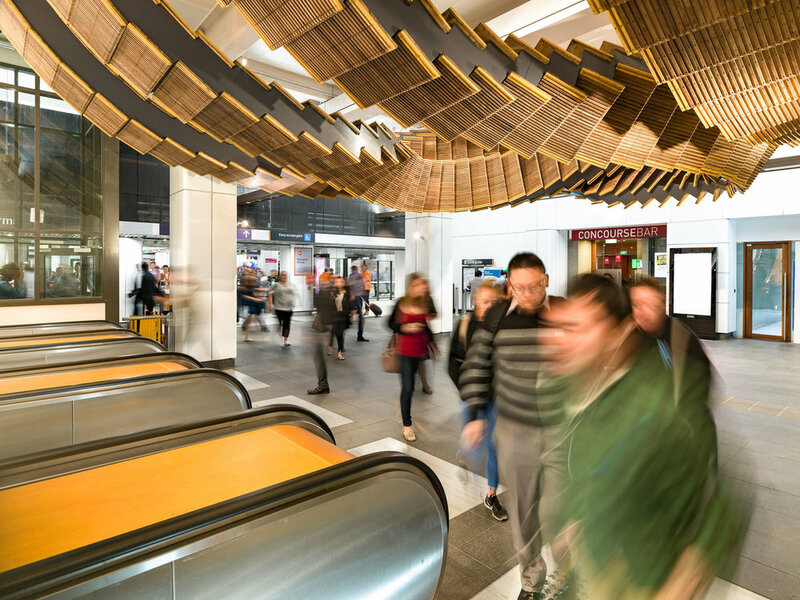 Chris Fox’s sculpture reconfigures the heritage escalators that operated here since the 1930’s. The consulting firm through which I practice, Cultural Capital was the art strategist and curator for the project. Our long association with this site gave us a detailed understanding of the environment of Wynyard Station; its meanings for Sydney’s commuters, the way its spaces work and its histories. When we work with art in the public realm we develop intimate relationships with the places in which we work. More often than not, art in the public realm is responsive to an important element of the place in which it is sited; an aspect of its geographic, historic or cultural landscape. Often a heritage component brings additional meaning into the relationship between art, place and people.